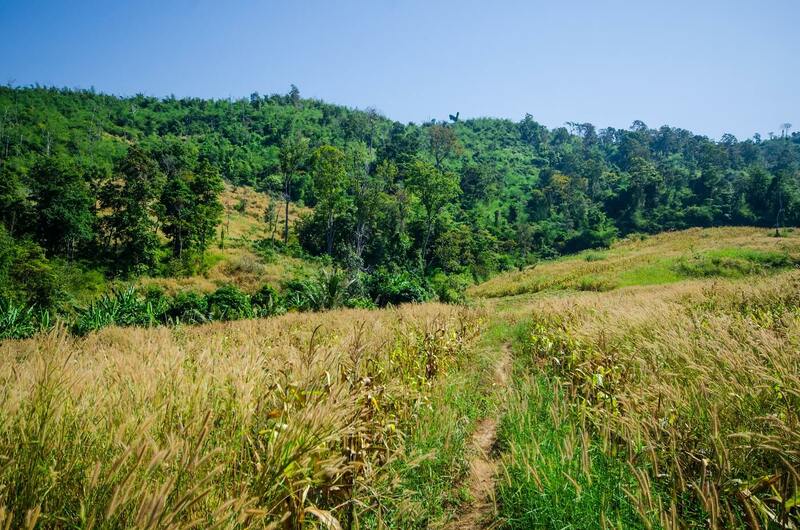 This 3-day trekking tour takes you from the Memoria Palace & Resort into the remote forests of Cambodia's Cardamom Mountains. Let yourself be surrounded by Cambodia’s picturesque and peaceful nature, calming breeze and delightful charm of the secluded area and its friendly locals. The Cardamom Mountains region is densely covered with lush virgin rain-forest and rise to their highest point at over 1,770m. The Cardamoms extend over an area of 4,420,000 hectares (10,922,060 acres) covering a large portion of South Western Cambodia. And are considered to represent to be one of Southeast Asia’s greatest natural resources in terms of virgin forest and wildlife habitats that have never been fully explored and/or cataloged. 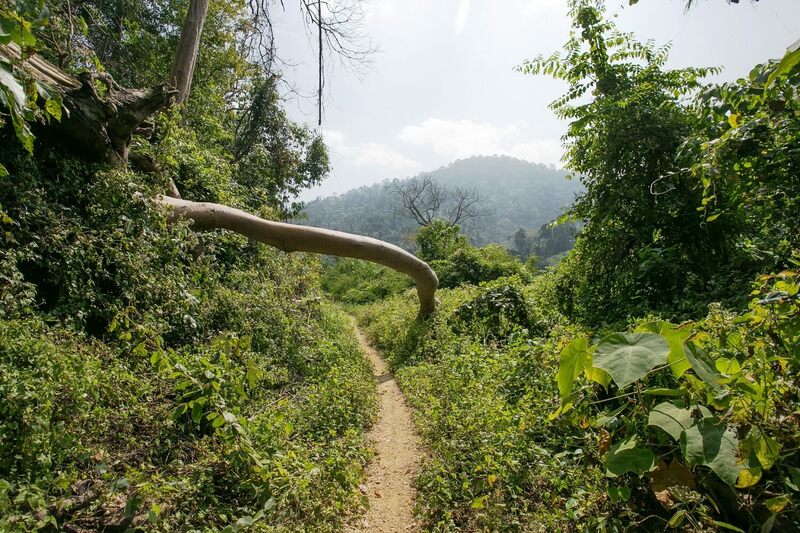 Memoria Palace & Resort, in partnership with a local community protected group, offers a series of multi-day treks into the unspoiled forests of the Cardamom Mountains. 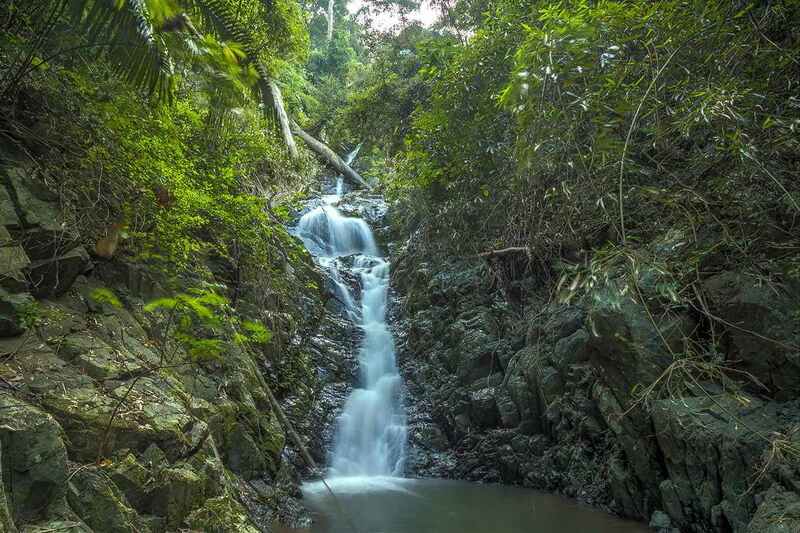 You can find various natural and cultural sites in the forest such as waterfalls, bat caves, and many endangered and unusual wildlife and plants. These multi-day tours lead you deep into the forest and include sleeping in open sky under the stars. We Leave Memoria Palace & Resort and drive 30 kilometers either by dirt bike, or motor bike, or tuk-tuk (1.3 hours) to Ou Dambong Commune. From Ou Dambang to Slev we get on tractor cart and drive 6km. During this ride, along the road you will be immersed in the scenic rainforests, so be on the lookout for birds and mammals. Upon arrival in the small, remote community of Slev, you meet the eco-tourism staff and get a short introduction to their hard work preserving the community and forestry. Afterwards there will be lunch and a meeting to discuss the activities for the following days. You will trek with local guides and Memoria Palace staff for about 6 to Ou Sangkot Beng where a camp will be set up. From here you will do some trekking during the day time to Ou Chab Kangkeb to bath in the unspoiled beauty of the 3 tier waterfall. Hike back to the camp then take bath and swim at Ou Slev (Slev water rapids) where the forest cook will prepare your dinner. During night, we trek for a few hours around the area to enjoy the nocturnal beauty of the surrounding environment. Many of the areas are unusual and unique in wildlife and night trekking is the perfect opportunity to catch a glimpse of them. The landscape and wildlife of Cardamom Mountains is often referred as one the best in the Southeast Asia for trekking excursions. Trekking is just not an adventure sport; it is an act of getting close to nature with an emphasis on forest exploration and experiencing the wilderness by night, thus you need an open mind and sharp ear to face the upcoming unknown phenomena from inside the jungle. People involved in night trekking develop and sharpen their power of observation to sense the unseen animals and birds during dark nights. The night trek around Ou Sangkot Beng takes you through thick tropical rain-forests and grasslands and offers opportunities to see deer, tiger-cats, wild-boars, gibbons, and baboons and possibly the elusive ktings voar, or snake eating cow. An early morning walk in the cool mountain area, framed by the slowly changing color of the sky to the 100 Elephants mountain for breakfast. You trek with same local guides and Memoria Palace staff for about 8 km from the last night’s camping area. Without the noise of human activity and traffic you can really appreciate the silence of the surroundings and hear birds from the thick forests. This is the ideal opportunity to see the area's bird-life as well as watching out for other wildlife such as monkeys and flying squirrels. At Knorng Damrey 100, you will set up a camp, followed by lunch and some trekking during the day time. Here you disappear into the forest, follow the winding and undulating trail which is full of exotic sights, scents and sounds, including horn-bills, parrots, wild pigs, deer and monkeys, gibbons calling from high up in the tree tops and many species of birds and rare butterflies, as well as the rare and endangered Lion Tailed Macaques. After a short break the trek continues, on route the guide will point out various signs of wildlife and various plants. Try the delicious forest leaves and fruits which they suggest. Hike back to the camp where the forest cook will prepare your dinner. At night, we do trekking for few hours to spotlight elephant, gaur bison, Kting, moose, bulls, and deer. After breakfast, you make another challenging trek for 7km to Ou Tavao following a trail left over from the guerrilla war. Along the walk, you can spot more flora and wildlife animals. 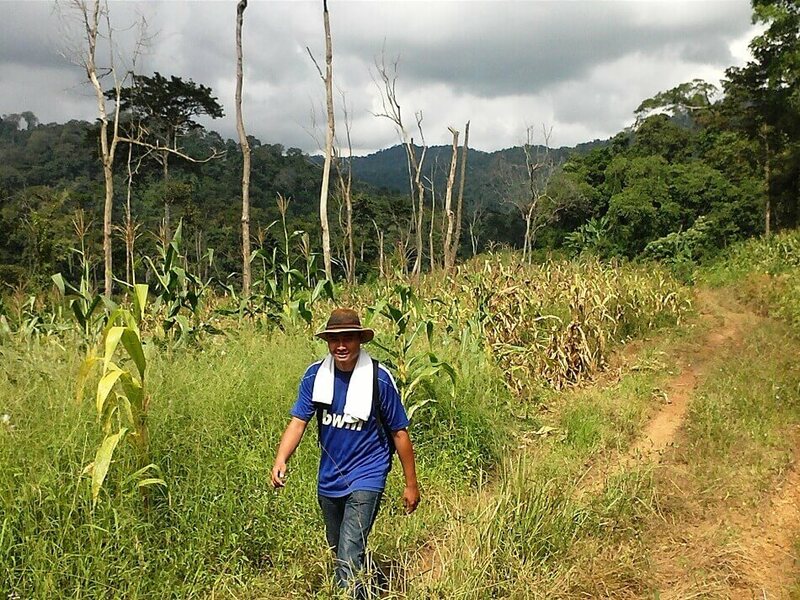 Much of today's trekking is through thick forests and grassland up and down the mountains. After some time you leave the shade of the trees behind and descend across open grassland then enjoy your lunch half way to Ou Tavao. After the refreshing meal and energy rejuvenation, you arrive Ou Tavao. 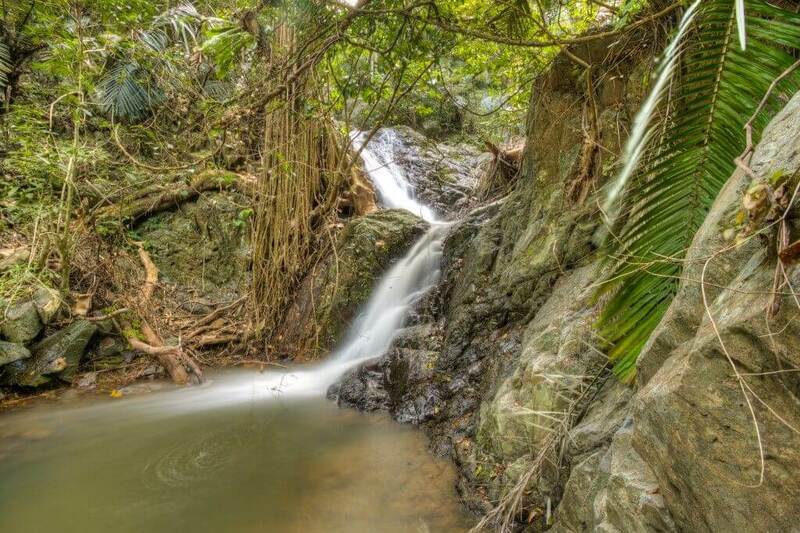 A tasty dinner will be served after your bath in picturesque Ou Tavao waterfall. At night, we do another final trekking for few hours to spotlight again some more unseen birdlife and wildlife or you can spend the rest of the evening around the campfire exchanging stories and gazing up into the starry night. After breakfast you continue another 3km to 5th tier of Blue Mountain water and bid farewell to your Cardamom mountains trekking adventure, allowing you time to reflect on the wonderful and unique trekking experience you have enjoyed in the unspoilt wilderness mountain of Cambodia. Taking away very fond memories, a tuk tuk will carry you on journey back to Memoria Palace & Resort where lunch awaits you. Tips before you go: Bring long trousers, long sleeve shirts, socks, gloves, torch, insect repellent, sun block, helmet and mountain boots or comfortable walking shoes which are the most important. Do not bring anything that you do not especially need (i.e. expensive watches, jewelry, large sums of cash). You will be carrying your own things. Most of the things you require can be purchased very inexpensively in the local markets. However, please take note that large size walking boots will be difficult to obtain here.